This beautiful tatted heart is a surprise gift from TattingChic. She tatted it with a size 20 hand-dyed thread named “Yummy Grapefruit” by Lady ShuttleMaker. TattingChic wrote that the pattern is by Irene Wood and called “Butterfly Heart”. It is as lovely and delicate as a butterfly. I just love it, and will find a special place for it soon. Thanks TattingChic. This entry was posted on Sunday, April 4th, 2010 at 3:00 am and is filed under Needlework. Tagged: Needlework, Thread. You can feed this entry. You can leave a response, or trackback from your own site. The tatted heart is really beautiful. I hope you have a wonderful day! Happy Easter! Very pretty tatted heart. Enjoy the day! Happy Easter my dear friend! I’m glad you like the tatted Butterfly Heart! 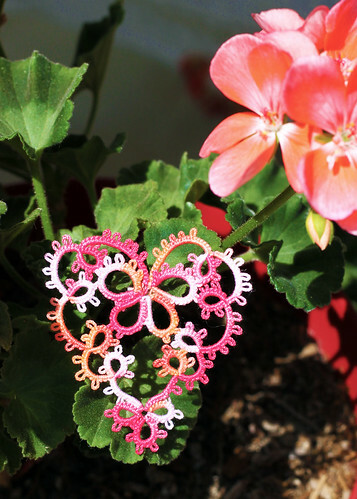 A beautiful piece of tatting and love the name of the color your friend used to make it! Hope your Easter was a lovely one.